LAWRENCE – Much has been made of Africa’s endangered and threatened animals – uniquely beautiful creatures such as the Black rhino, Western lowland gorilla and African elephant – but what of the continent’s endangered languages? More than 2,000 languages are spoken in Africa, accounting for a third of the world’s languages. While the continent is home to more languages than any other, its disappearing languages have received less attention than those that are vanishing in Northern Asia, Australia and the Americas. This spring, the University of Kansas will host a workshop on Africa’s endangered languages. The workshop is part of the 45th Annual Conference on African Linguistics and is funded by a National Science Foundation grant. Harold Torrence, an associate professor of linguistics, and Jason Kandybowicz, an assistant professor of linguistics, have studied the endangered Ghanaian language Krachi and are organizing the conference and workshop. Just as globalization has threatened the Earth’s most biologically diverse communities, the same is true for regions of the world that have a rich variety of languages. Just how many languages in Africa are endangered is unknown. Estimates are between 200 to 300. The number can be hard to gauge in a region where most people speak at least two languages and often more. Researchers have to differentiate unique languages from a mesh of numerous dialects. A language is at risk when it is no longer being passed down to younger generations. That’s a common occurrence in Africa, where schools favor colonial languages, such as French or English, and national languages favor the region’s majority language, such as Arabic or Swahili. In southern Africa, where native tribes are known for their unique clicking sounds, some languages are down to 10 or fewer speakers. In other parts of Africa, speakers tie their ethnic identity to their native language and consider themselves speakers of it, but in reality they are mostly speaking the region’s dominant language. For decades, biologists have been educating the public on the societal importance of saving endangered plants and animals. Linguists see a similar value in preserving disappearing languages. One of the challenges in preserving African languages is a lack of funding and infrastructure. Some of that progress includes encouraging African scholars to study native languages over dominant regional ones, teaching early education in native languages or just increasing awareness that a language could be threatened or endangered. The workshop intends to bring together those who are in the field documenting the endangered languages and those who are analyzing data to better understand why languages are disappearing and how to best preserve them. 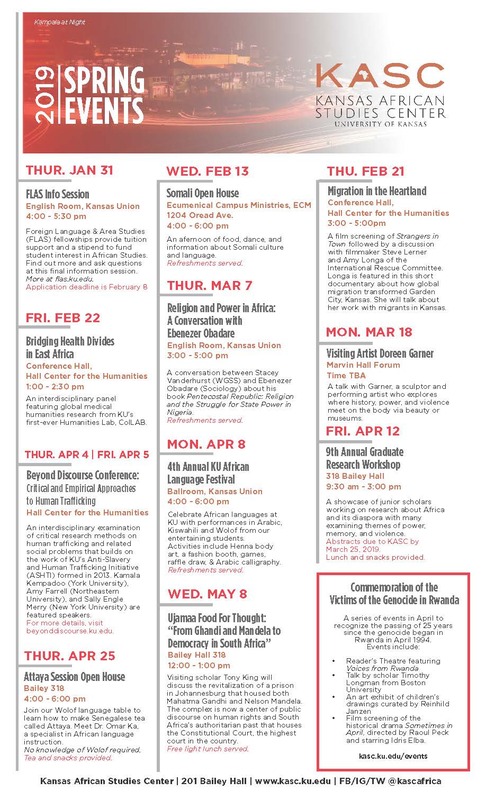 The conference, which will be at KU from Thursday, April 17, to Saturday, April 19, is sponsored by the Kansas African Studies Center and the College of Liberal Arts & Sciences.